Visit the Old School at www.mynewoldschool.com. Click the link that says “subscribe via email” and follow the instructions. This should get everything all as it should be. There are also links for subscribing in a blog reader as well as Facebook, Twitter, etc. The Damsel misses you! Hope to see you soon. A while back (oh, a year or so) the Old School moved to its own domain. Things there are lovely. But wordpress.com only forwarded visitors to the new site for one year, so things look lonely here all of a sudden. There are lots of new posts to see…and the Damsel misses you. So come on over to the New Old School. The Old School is getting ready for something exciting. It’s moving to its own domain! Yay! The Damsel is working hard to make this a smooth transition, and there may be a slight delay before there are fresh posts. Think of it as recess! It won’t be too long, maybe a day or two. The Damsel thanks you for your patience…and hopefully soon, she’ll have the new schoolroom ready for you. Have fun playing, but don’t step on a crack and break your mother’s back. Here’s a recipe making your own spot cleaner for your carpet. Goodness, it’s cheap. Grandma would approve. Put 3 cups (or thereabouts) of warm water into a container. The Damsel has a lot of quart jars hanging around, so she reached for one of those. Add 1/2 cup plain white vinegar. The thought behind the “plain white” is that dark vinegar might make a spot of its own. Now add 3 tablespoons of baking soda. Careful! A certain unnamed person dumped this in all at once, completely forgetting anything about science fair volcanos. That certain person watched in amazement as half her solution bubbled up and over the sides of her jar. Ha ha! That person is silly. Stir. Yes, it will bubble and foam and so on, giving us all hope that there is something magic going on, because that’s what carpet spots need. Now the Damsel fearlessly takes you to her living room, where a few mysterious spots have appeared. Grandma would not approve. The Damsel has learned not to ask why or how the spots came to be, because life is already full of enough futility. Scrub the offending spot with a cloth or scrub brush. Let it dry, then vacuum. Now the Damsel can hold her head high again. P.S. the green bracelet seen on the Damsel’s wrist is in honor of the Damsel’s brother in law, who is fighting cancer with a lot of strength and style. Ben’s a frequent reader of the Old School, and if you felt like giving him a shoutout in the comments, it’d bring a grin to that big ole currently-bald face of his. There are a few ways to make gravy. 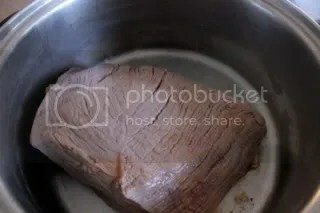 This method is just one, and it works best for Old School pot roast because of the amount of water you have to work with. Now that the meat and vegetables have cooked for several hours in the liquid, you’ve got a nice beef broth. All you must do now is thicken it. The Damsel has seen normally well-adjusted people run crying, faces in their hands, at the thought of making homemade gravy, because they’ve heard their reputation as a cook rises and falls on the ability to make lumpless gravy. Don’t worry. The Damsel will hold your hand, and your reputation’s safe. Remove the nice, tender slab-o-beef to a platter. Hopefully it’s so tender you’ll have to be careful, or it will fall apart as you move it. Take out the potatoes and carrots, too, with a slotted spoon. Cover them both with foil to keep them warm while you make the gravy. This only takes a few minutes, so get the kids setting the table. Turn the heat up on the pan that now contains only the broth. There should be quite a bit…4 to 6 cups, maybe more, maybe less. A smaller remainder, like 2 cups, could be caused by evaporation during the long cooking period, but if you have a tight-fitting lid for your pot, most of the liquid should remain. You can add water if you need to end up with more gravy. Spike it with some beef bouillon if you add more than a cup. While that comes to a boil, put about a cup of flour in a jar. A canning jar will work if one’s lying around handy, but any jar with a lid is fine. Add COLD water at a ratio of about 1:3, (one cup flour, 3 cups water) but please don’t measure. It ruins the magic. It needs to be cold water because hot water will sort of cook the flour, and that will make it LUMPY!!!! Put the lid on the jar and shake it. HARD. Shake it until the flour and water are completely mixed. Position yourself in front of the stove, armed with the jar in one hand and a whisk in the other. When the broth is boiling, shake the jar one last time, take the lid off, and pour a small stream into the boiling broth, while stirring madly with the whisk. Pour in about half of the flour mixture, and stir for a minute or two. The broth should look somewhat gravy-like now, opaque rather than clear. If you’d like it thicker, add more flour mixture, stirring all the while. Remember that it takes a minute or so after an addition for it to thicken. If you get it too thick, it’s okay. You can add water, a little at a time. Lumps are usually caused from the flour/water mixture being lumpy, so if you’ve shaken that well, you should be good to go. You can use the blender to make the flour/water mixture if the shaking thing isn’t working for you. And, there’s no shame in putting the gravy in the blender, either, if you still end up lumpy. Or use an immersion (stick) blender if you like. Onion floaties from the onion soup mix don’t count as lumps and are perfectly fine. Cook and stir for a minute or two to make sure the flour’s all cooked. Add plenty of salt and pepper and taste. Then taste it again poured all over a plate of roast and veggies. The Damsel grew up on this–the family’s favorite special-occasion/Sunday-after-church meal. She can never get tired of the yummy stuff. To make pot roast, you need time. Lots of time. Pot roast needs moist heat over a long period to get tender. Some people use a crockpot, some people the oven…this particular method is done on the stovetop…but they all have one thing in common. Time. First, heat a little oil on medium in the bottom of your nice heavy pan–a dutch oven or some such. Plop the roast, fat side down, into the hot pan. It will seem like a strange thing to do, but everything will be okay in the end. After a minute or two, stab it with a fork in order to turn it. Brown it on all sides, or until you’re tired of it. Pour in some water…fill the pot until water comes about half way up the roast. It will seem like a lot, and the pot will look strange with that great glob of raw meat sitting knee deep in water. But you must trust the Damsel and press on. 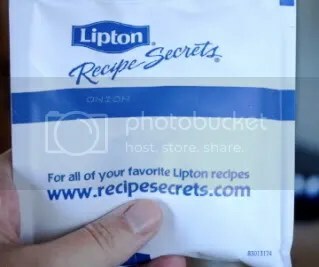 Sprinkle in a packet of onion soup mix. The Damsel has been mocked for using this. The mocking individual says it isn’t old school, and perhaps they are right. But the Damsel learned to use this from her mother, who happens to be a great-grandmother, so at some point, onion soup mix becomes old school, right? Sprinkle it both on top of the meat and around it in the water. Put the lid on the pot and turn it down low. It will need to just cook contentedly for a long, long time. Like 5-6 hours, depending on the type of roast you’re using. The way you tell if it is done is–scientifically poke it with a fork. By the time you eat, you want this meat tender enough to fall apart. This is the Damsel’s wish. At some point before the magical falling-apart stage, you will pack the pot with potatoes and carrots. You can do this after a couple of hours of cooking or right away, if you need to leave the house for the day. Push them down into the water when possible…these get extra yummy. By the time the meat is tender, the vegetables will be too. The house will smell like heaven, and you’ll hear shouts of acclamation as you call the family to the table. There’s just one more step…making the gravy. Because people think making gravy is tricky, and because this gravy is oh so worth it, it’s going to get its very own Old School post. Don’t worry. It’s not hard. Guess you can tell what time of year it is here at the Damsel’s cottage, with all the preserving, etc. posts. The end of summer, the harvest season. So what about freezing tomatoes? Does that work? It actually works quite well, the main drawback being limited freezer space. And, of course, the possibility that your freezer might go out/the power get knocked off/the end of the world. In that respect canning in jars is, well, safer. But if you have a nice big deep-freeze, and you feel pretty confident about the world continuing in its normal orbit for at least another few months, then freezing tomatoes is a great option. It’s ridiculously easy. You don’t have to do ANYTHING to the tomatoes except maybe wash them. Then put them, as is, into a ziplock freezer bag. After they freeze, they’ll be like cold, hard balls. Or cold, hard oval-shaped thingies if they are Romas. 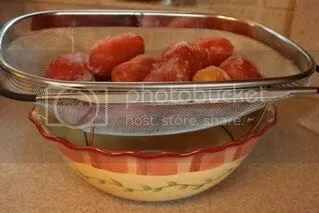 To use them, you can put them in a strainer like so and let them thaw. Or just put them in a bowl. A LOT of liquid comes off these babies. When they are thawed (or even partially thawed) the skins will slip right off. That’s right. Just by freezing them, the skins will slip. No blanching necessary! The Damsel loves this so, so much. The Damsel also loves that all that liquid drains off, so the resulting tomato goo is Nice and Thick. To get it this thick, you’d have to cook it down for a long, long time. Yay! Even less time slaving over a hot stove! 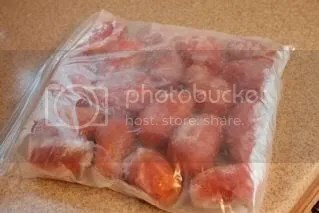 The other thing that is perfectly wonderful about freezing tomatoes is: if you find yourself falling behind in canning your tomato harvest…or have tomatoes you just can’t use quick enough…you can just throw them in the freezer. Then later, you can take them out and do stuff with them. Maybe it will even be winter by then, and you won’t mind the hot stove so much. Now, just remember that the thawed tomatoes are going to be mushy, and are fit only to be used in a cooked dish. The Damsel doesn’t want to create any unrealistic expectations here. But these guys are perfect in a marinara sauce, or any other cooked tomato-based dish. Think about how fun it will be to have both mysterious cold, hard, red balls AND black bananas in your freezer. The Old School has moved! Please come to The New Old School for lots of new posts! The Damsel in Dis Dress is your teacher for today. Her qualifications are that she is "old." Old School is where you get to learn about some old skills and other thingies that Grandma used to know like the back of her age-spotted hand. Why would you want to learn old stuff? Two reasons. 1. Last time the Damsel checked, the economy was still tanking. Some things you'll learn in Old School will help save money. 2. Other things will help you be more self-reliant. You'll learn how to do things that Grandma used to do all the time, but people have forgotten. But why, Damsel? Why? Because the day may come that we'll need those skills, and it's part of being prepared. Plus, the Damsel thinks it's nice to keep those skills from being lost.